Left brain, right brain, pug brain. : Cheesy Zucchini & Rice Casserole. 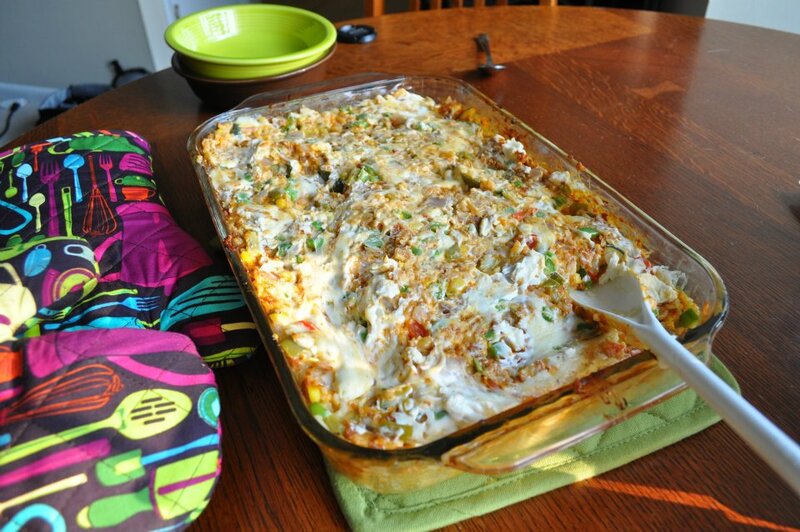 Cheesy Zucchini & Rice Casserole. Pour rice into 9X13 baking dish. Bring broth to simmer in a small saucepan, then stir broth, zucchini, peppers, onion and salt into rice. Cover with foil and bake 45 minutes; remove foil and bake 35-40 minutes more. Whisk milk and flour in a small saucepan. Cook over medium heat 3-4 minutes (until thick). Reduce to low heat and add cheese and corn. Stir until cheese melts. Stir sausage and cheese sauce into the rice mixture. Sprinkle remaining cheese and jalepenos on top. Dollop cream cheese on top and bake 10 more minutes, until the cheese melts. This may be our favorite recipe I've ever made. Serves 12 at 250 calories per 3/4 cup serving. umm i love zuccini, cheese and rice, i want to make this!! !